What is Pray and Paint? Pray and Paint is a contemplative form of prayer, which encourages us to connect with God and express our experiences through creative art. The introduction to materials and format. (relaxed and informal, usually over coffee with the opportunity to ask questions). A time of contemplative prayer, using music, silence and scripture. Choose your materials and find a 'comfortable space' to begin painting. (Kate will move around offering any required support during this time). Regroup and share experiences. (Some may have had very personal experiences, it is up to each individual whether they choose to share or not). Time to look at others pictures, chat, have another coffee and generally enjoy the whole experience. Session ends with a time of open prayer. All artists are free to take their pictures home, have them framed, and hang them up, they make great conversation starters. Anyone can take part regardless of age or gender and no artistic experience is necessary as full support is available. 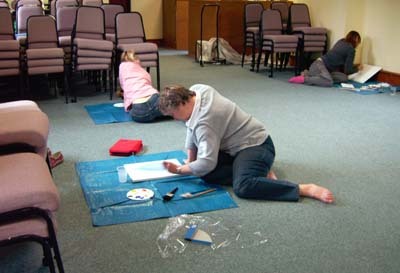 A Pray and Paint workshop can take place in your home, in your Church, or any where quiet and spacious.